There are many famous places to visit in France – some may seem obvious, Paris, Nice, Provence for a start but there is so much more to see. As you will know if you’ve had a look around our website you’ll understand that I like to get off the beaten track a little. This page is an introduction to a number of places we have visited in France along with detailed reviews and information about how to get there. Like the rest of the site, this is my own work and as I visit more places you’ll get more reviews! I will also tell you where we stayed and how you can do the same as well as how to get there. On the longest of our trips over to France we spent one month on the road and found some wonderful places, there were also many that I didn’t have time to see but did a lot of research about so I will do my best to enlighten you as to the best places to visit in France. The links on this page will send you through to pages about regions and towns and from there you will be able to choose whether you wish to read about the culture, food transport links among other things. This town is easily accessible by road as well as good train and air links into Perpignan; we stayed with Al Fresco Holidays at Mar Estang in nearby Canet Plage which is not really on my list of best places to visit in France overall but a great base for exploring the region from. 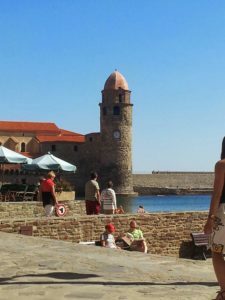 I have written multiple posts about this region as I fell in love with it and you can navigate through to them from the Languedoc-Roussillon page. The area is also featured heavily in my book which takes you on a journey with us as we travel off the beaten track places. Brittany, One Of The More Popular Places To Visit In France. One of the more common places to visit in France is Brittany, easy access from major towns in the north of the country as well as several incoming ferry ports from the UK. It’s a wonderful region and one that offers white sandy beaches akin to those found in far more tropical climates! We have stayed in three different places in Brittany and I am in the process of writing the reviews now. Once they are completed I will link to them from this page as well as from the accommodation tab on the main navigation menu. I also love this region (are you noticing a theme!) partly because of it’s ease of access for us living in the south west of England, in fact I am thinking of buying a property in Brittany as an investment. More on that later! On the negative side I guess would be the lesser amount of sunshine when compared to other areas in France but that, after all, is what this website is all about; giving you as much useful information to be able to compare different places to visit and live in France. They are all unique and offer something different with diverse food and culture and even language. Brittany is a place where I was privileged to witness something which I try to remind myself of if I’m feeling a bit down in the dumps, I took a day trip and drove off the beaten track and Lola and I found a deserted cove. It was May so fairly quiet but after a few minutes we no longer had the place to ourselves. You can read about it at A Special Day In Brittany. Ceret is one of the best places to visit in France if you are looking for a relaxed atmosphere and immersion into French culture. It features heavily in my book but I’ve also given you a sample of my writing on my page about Ceret. I am going to leave you and head off to complete the numerous posts and pages which will tell you all about what I feel are the some of the best places to visit in France.